Violence struck in Britain Wednesday in the form of a terror attack outside the British Parliament, leaving five people dead, including a police man, and many others injured. 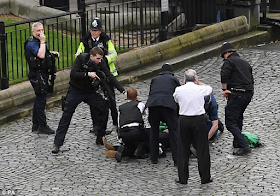 The attack occurred at about 2:40 p.m. at which time gunshots were heard near the British Parliament. It began when the driver of a car drove along the Westminster Bridge which leads to the House of Commons, mowing down pedestrians. 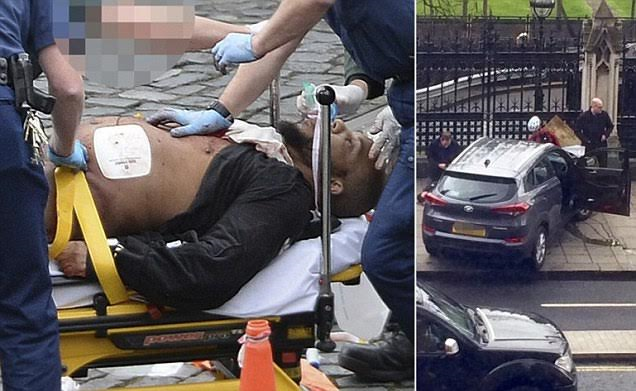 Five people were killed and about 40 injured in London after the car plowed into pedestrians and a suspected Islamist-inspired attacker stabbed a policeman close to Britain's parliament. 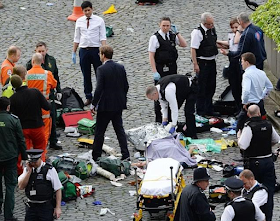 Prime Minister Theresa May condemned the attack as "sick and depraved." After the driver plowed the pedestrians, he then alighted from the car after the crash and sprinted to Parliament where Theresa May had been answering Prime Minster's Questions in front of hundreds of MPs, there he went on a stabbing spree and stabbed to death an armed police officer guarding the place. The man's momentary reign of terror was brought to an end when he was fatally shot by police. 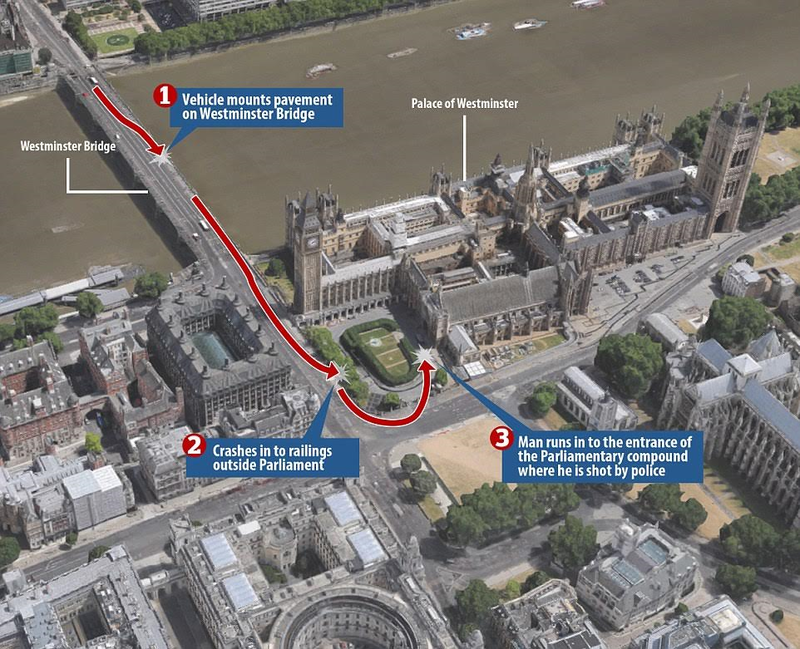 During the attack, Westminster police bundled Theresa May into a car and rushed her away from Parliament. 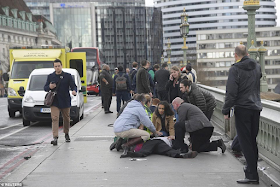 The police said they were treating the attack as an act of terrorism, which makes it the most serious assault in London since the deadly subway bombings more than a decade ago. 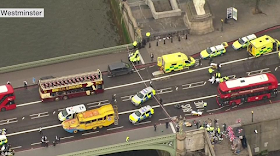 A number of people are in critical condition at the hospital. 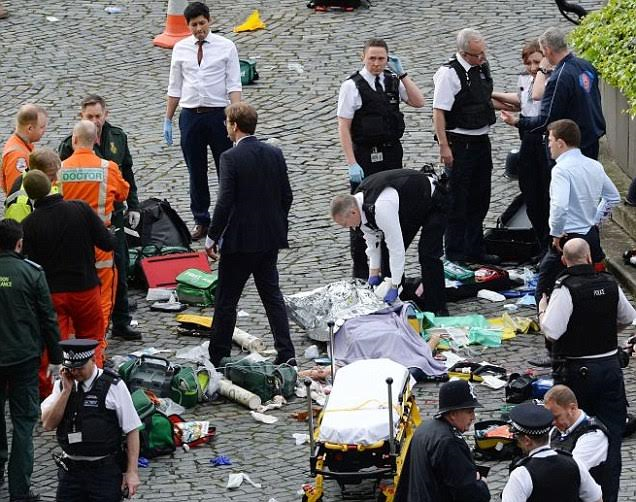 Among the injured were teenage schoolchildren from France. 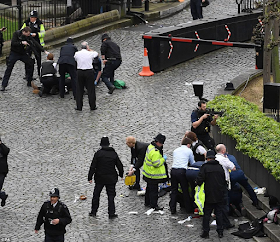 As the attack came to an end, ambulances, emergency vehicles and heavily armed security officers thronged the area outside the House of Commons. 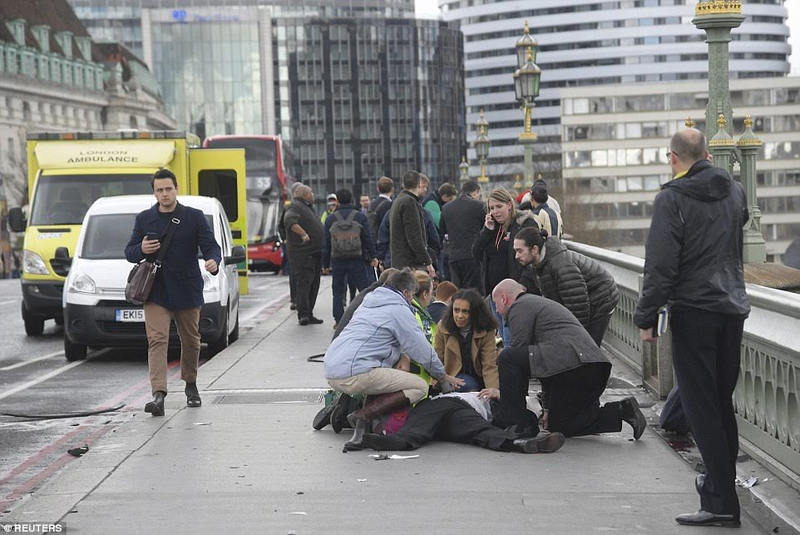 In all the confusion resulting from the attack, a man was seen shouting that his wife had jumped into the River Thames in a desperate attempt to escape the terrorist. 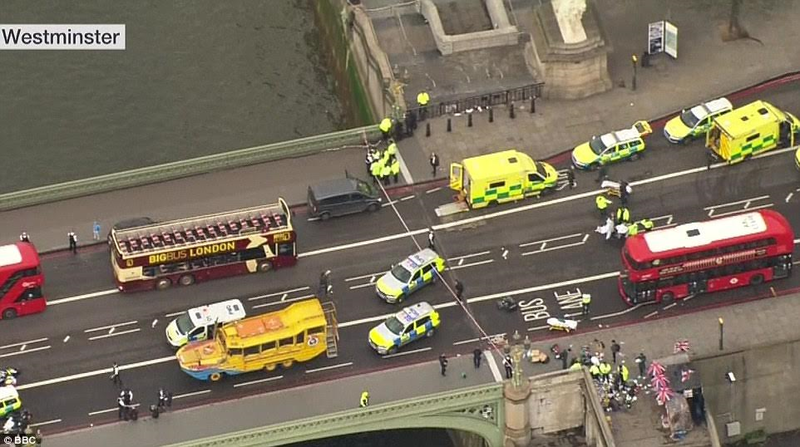 One victim of the car attack was left floating face down in the Thames but was pulled from the river alive. 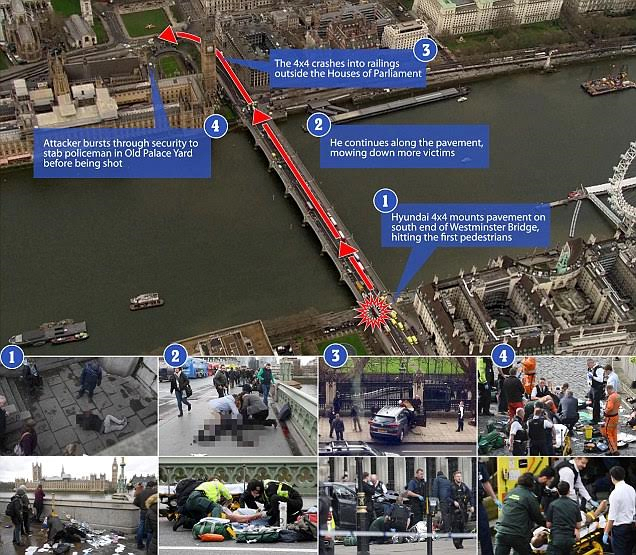 The bridge above was strewn with the victims of the terror hit and run. 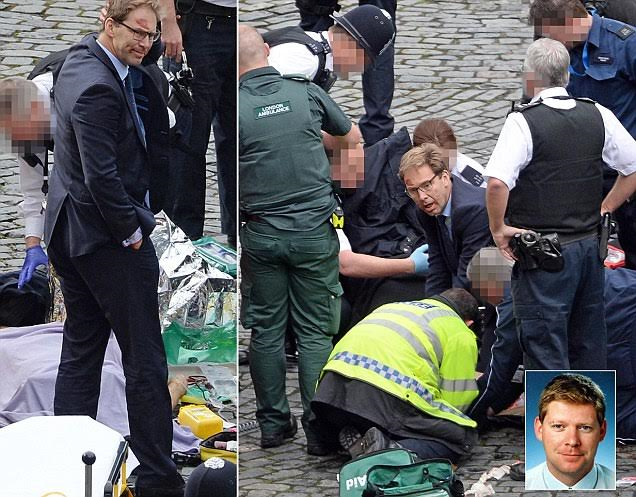 Witnesses said the aftermath was like a scene from a 'Hollywood disaster movie'. 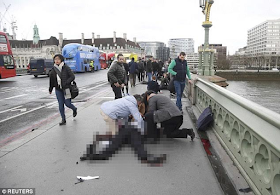 After the attack, sympathizers thronged the Bridge to comfort injured victims lying in a pool of their own blood. 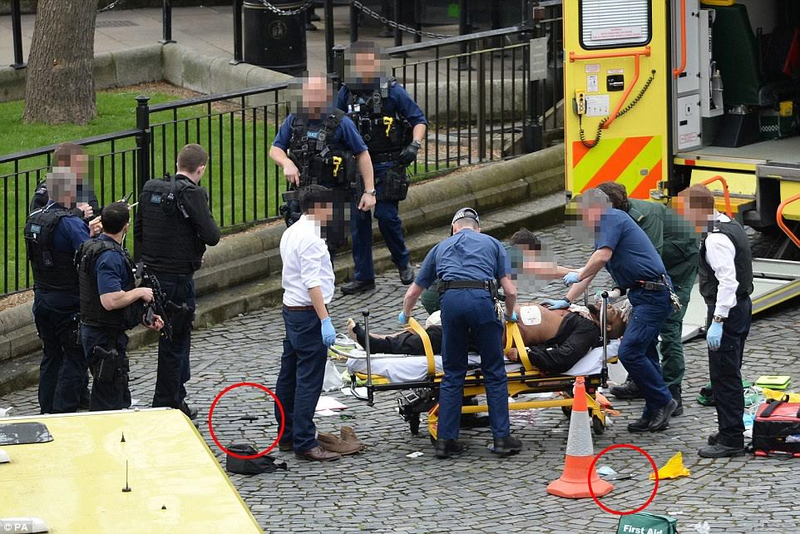 Below is one of the many videos from the attack. 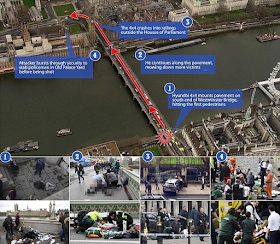 Video shows the moment shots were fired and people fled in all directions screaming for their lives.